Charleston, Key Port For Slaves In America, Apologizes And Meditates On Racism Today The plight of migrant families at the U.S. southern border was also mentioned, amid discussions of exploiting laborers and treating people of a different race as chattel in the slave era. Charleston's City Council approved a resolution apologizing for its "role in regulating, supporting and fostering slavery and the resulting atrocities inflicted" as a result. Tuesday's vote took place in Charleston's City Hall — which was built by slaves. Charleston, S.C., has formally denounced slavery and apologized for the port city's role in that evil institution. The City Council voted 7-5 to condemn the industry that had long thrived in Charleston — the entry point for nearly half the slaves who were brought from Africa to the U.S.
A capacity crowd gathered to comment and to witness the council's vote Tuesday, which followed a number of speeches on slavery and its role in building Charleston and adding to American prosperity. If anyone at the council meeting wanted to see a sign of that legacy, they didn't have to look far: Charleston's City Hall was built by slaves. More than once, the current plight of migrant families at the U.S. southern border was mentioned, amid discussions of exploiting laborers and treating people of a different race as chattel during the slave era. Some of the speakers called for restitution; some asked for help in preventing racism from regaining influence; many asked the city to start by putting its name on an official apology. 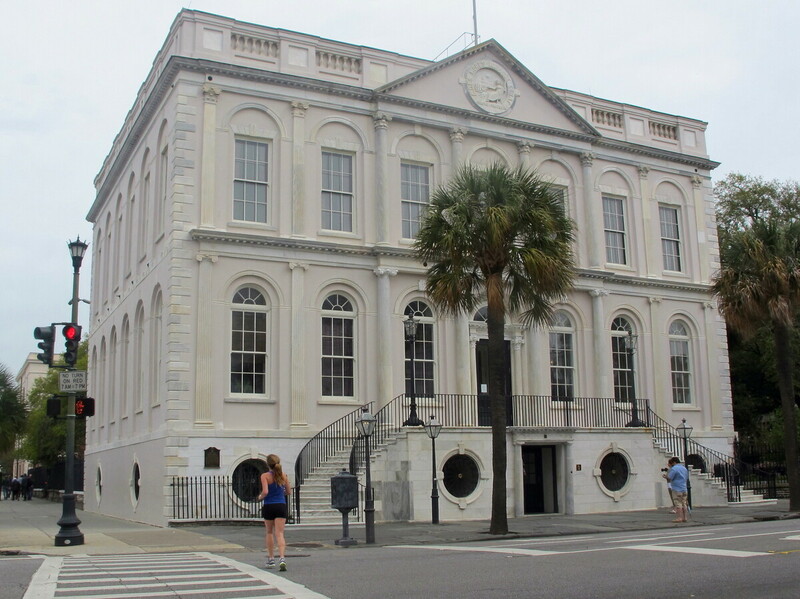 The council approved a resolution "recognizing, denouncing, and apologizing on behalf of the City of Charleston for the City's role in regulating, supporting and fostering slavery and the resulting atrocities inflicted by the institution of slavery." The measure also calls for the city to "honor the contributions of those who were enslaved and that assist in ameliorating remaining vestiges of slavery." Charleston adopted the resolution on Juneteenth, the celebratory anniversary of the end of slavery in the U.S. But several times during Tuesday's session, speakers reminded those present that racism is not a vestige of America's past – and that battles over how the Civil War and slavery are remembered are still being waged. The vote came days after Charleston marked the third anniversary of the deadly shooting of nine black parishioners at Mother Emanuel AME Church. "The past is never dead. It's not even the past," Councilman William Dudley Gregorie said, quoting author William Faulkner. An African-American and a main sponsor of the resolution, Gregorie said, "What reminds us of that is what is going on right now, with brown children who are being torn from their parents and being put into detention camps. I hope you heard me — and it sounds familiar." Discrimination has to be cut out from American society, Gregorie said, "in order to make ourselves whole." "Regardless of how my colleagues vote today, I still love them," he said. "None of them are racist, based upon my interaction with them." Gregorie then noted the City Council's historic role in perpetuating slavery, referring to the bloody quashing of a slave rebellion that had been planned by the freedman Denmark Vesey decades before the Civil War. The council and mayor "voted for Denmark Vesey to be hung at the public square, and to let his body rot in the sun," Gregorie said. "That was 1824. This council," Gregorie said, pointing down to the table in front of him. "Some council members voiced their opposition, saying apologizing isn't enough," South Carolina Public Radio's Victoria Hansen reports for NPR's Newscast. "What the city's African-Americans really need, they say, is affordable housing." Councilman Keith Waring said, "Without economic empowerment — as a descendant of slaves — I cannot support this resolution," according to The Post and Courier. The resolution was approved less than a mile from the spot where Africans arrived in chains, for more than 100 years in colonial times and continuing during America's first decades. Many of these people were sold at open-air auctions; later, enslaved people were bought and sold at places like Charleston's Old Slave Mart, which is now a museum. Charleston's debate over the apology included a speech looking back on the last years of slavery, which came from Alex Sanders, a former judge who has also been the president of the College of Charleston. "William Henry Seward was secretary of state under Abraham Lincoln all during the Civil War. Naturally, he was opposed to slavery. But he wondered whether abolishing slavery was worth the country going to war with itself. "He thought the radical abolitionists had probably exaggerated the horrors they described. After all, the Southerners who came to Washington from such civilized places as Charleston, S.C., were such consummate gentlemen. He could hardly believe they would seek to perpetuate the acts of cruelty the abolitionists said were a part of slavery. "So he decided to take a look at the South for himself. He took a tour; his wife went with him. Their journey had just begun, by horse and buggy, when they encountered a lone horseman on the road – a slave trader. Trailing behind him, a dozen black children chained together at their necks. "They were little boys and girls, not more than 6 or 8 years old. They were completely naked. They were crying for their mothers. Mrs. Seward became physically ill. Her husband turned the buggy around and headed back to Washington. They had seen enough." Sanders concluded that the resolution's apology for slavery comes from the city, not from any one person — "but we all enjoy the benefits every day of what enslaved people were compelled to produce when they built so much of the city of Charleston." He added, "At the very least, we can say we're sorry. "Unless of course, we're not sorry. You can let us know by your vote."